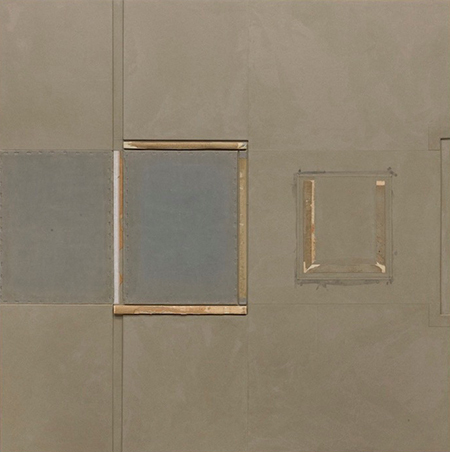 John Fraser, "Rain in the Jordan," 2013, mixed media collage on panel, 40 x 40 x 2 1/4"
Despite the fact that John Fraser’s exhibition, “Interval & Ratio,” is full of dismantled and reworked hardcover books, the works are neither intended to be or come across as “book art.” Rather, the Chicago native’s motives more aligned with that of the Minimalist canon. The insides of the spines and covers are splayed out geometrically upon panels, their collaged, monochromatic rectangles resembling a more tactile incarnation of Robert Ryman. Though the aesthetic is Minimalist, there’s no denying that the books are immediately recognizable, supplying a wealth of associations and content of their own. However, the “content” that the books bring is not their actual contents. The shredded inlay of the spines provides evidence of the rough removal of pages. One can imagine that Fraser’s selection of collage material has less to do with the narratives, opinions and lessons that these books may once have contained, and everything to do with their aesthetic potential; not the symbols realized through prose, but what books themselves symbolize. But, Fraser does not entirely erase the literary. With titles like “Rain in the Jordaan,” the artist gives back to the collage material a hint of poetics but without the didactics, providing just enough of a prompt to make us wonder.